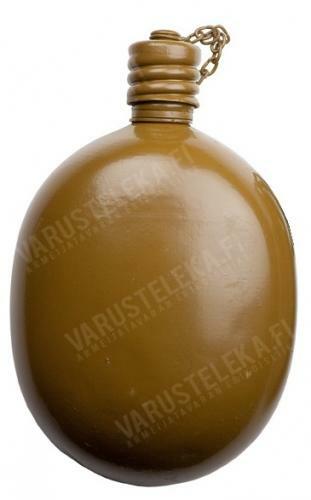 This standard Soviet issue water bottle has stayed more or less the same since the times of the Great War, and is still going strong! No pouch included with these. A very simple aluminum canteen. Volume probably 0,85 litres. The colour is a special Soviet blend of greenish brown with a hint of mud and despair, left untreated on the inside of the bottle. 1. Fill the bottle with sand and shake it for about 5 minutes. Pour the sand out. 2. Wash the bottle and fill it again with water containing baking soda. Let sit for the night. 3. Pour the water out and wash the bottle with regular bottle brush, rinse afterwards. 4. The bottle is now ready for use. Although most of these appeared unissued, it might come with dents and scratches and other marks of long storage. We do recommend cleaning before use.